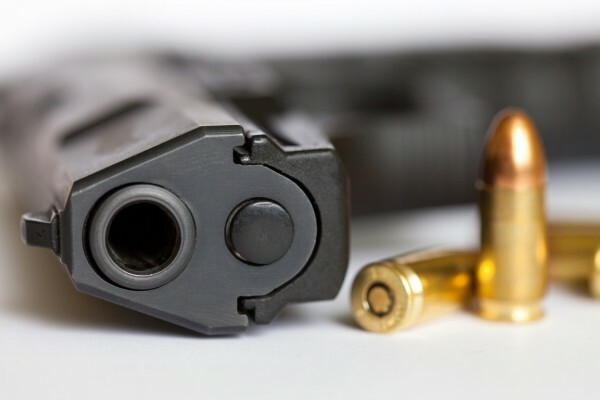 A new research report carried out by the University of Washington’s Institute for Health Metrics and Evaluation, shows the number of recorded fatalities attributed to guns across the world – including data on South Africa. The study, the latest on the Global Burden of Diseases, Injuries and Risk Factors, shows that more than 250,000 people died from firearm-related injuries in 2016, with half of those deaths occurring in only six countries. 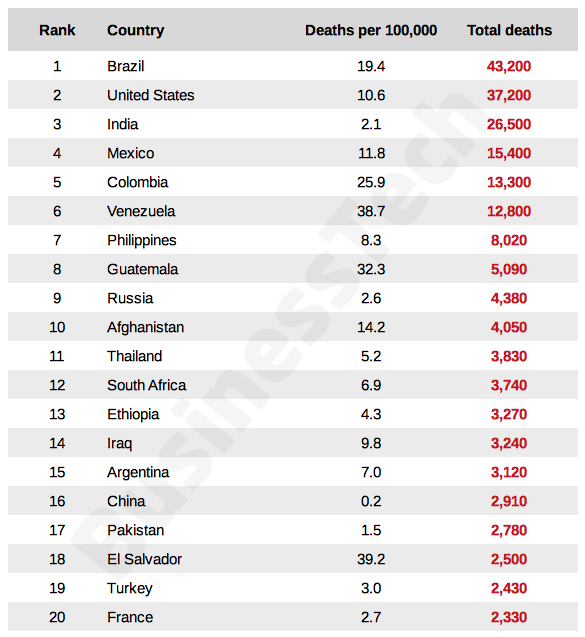 All of these top gun-death countries are in the Americas, led by Brazil, the United States, Mexico, Colombia, Venezuela, and Guatemala. South Africa, however, also ranks highly – 12th on the list overall – with Ethiopia (13th) being the only other African country ranked in the top 20. According to Dr Mohsen Naghavi, a professor of global health at the Institute for Health Metrics and Evaluation (IHME) at the University of Washington, and first author of the study, the research confirms what many have been claiming for years – “that gun violence is one of the greatest public health crises of our time”. The study’s authors found patterns of firearm-related deaths vary widely by country and by cause. In 2016, 64% of global firearm-related deaths were homicides; 27% were suicides, and 9% were accidental injuries. Firearm-related homicides were the largest fraction of all firearm deaths in 113 of 195 countries and territories in 2016, whereas firearm-related suicides were the largest fraction of all firearm deaths in 67 nations. Global firearm-related deaths exceeded global conflict and terrorism deaths every year from 1990 to 2016, except 1994, when the Rwandan genocide occurred. The authors also revealed that in 2016, 87% of global firearm-related deaths – totalling 218,900 – were of males, with more than 34,700 male deaths occurring in the 20-24 year age group alone. In 2016, with 39.2 deaths per 100,000 people (age-adjusted), El Salvador saw the highest cumulative firearm-related death rate globally; Singapore, with 0.1 deaths per 100,000, had the lowest death rate. 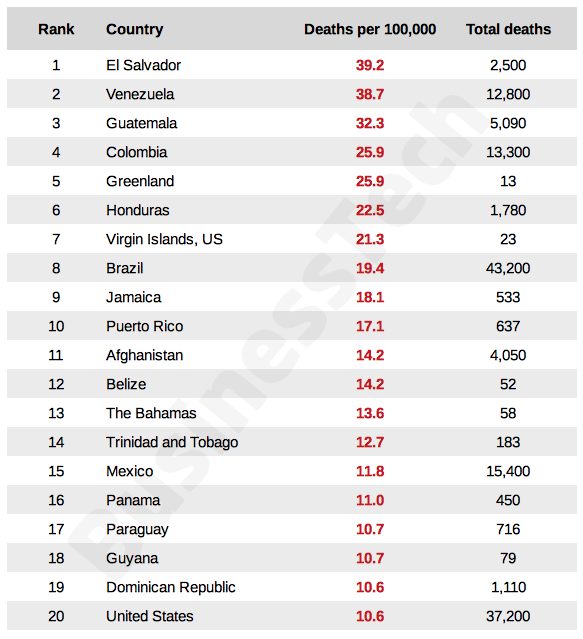 The six countries in the Americas accounting for half of all firearm-related deaths in 2016 are Brazil (43,200 deaths), United States (37,200), Mexico (15,400), Colombia (13,300), Venezuela (12,800), and Guatemala (5,090). Aggregate firearm injury death rates decreased in most countries between 1990 and 2016; however, 41 countries – nearly half in Latin America and the Caribbean – saw constant rates or substantial rate increases. While the absolute number of firearm deaths globally increased from 209,000 deaths in 1990 to 251,000 deaths in 2016, the firearm death rate decreased slightly over the same time period. Across the 26-year span of the study, the firearm homicide rate stagnated, with no significant decrease recorded between 1990 and 2016. After Greenland (territory) with 22.0 deaths per 100,000 in 2016, the United States had the second-highest age-adjusted rate of suicide by firearm (6.4 deaths per 100,000) in the world. 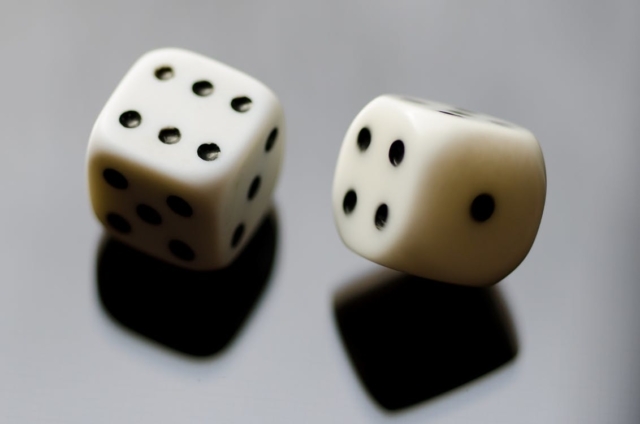 The researchers referenced South Africa as a case study for how gun control can effectively curb gun deaths in a country. “The patterns documented in South Africa…support a link between regulatory restrictions on firearm access and subsequent reductions in firearm death rates,” the researchers said. The most recent small arms survey found that there are currently 5,351,000 firearms in civilian possession in the country – placing it as the 20th highest in the world behind countries such as Saudi Arabia (5.5 million) and Iran (5.9 million). Of these, approximately 3 million are registered (legal) firearms, while the remaining 2.35 million are unregistered. This means that there are effectively 9.65 civilian firearms per every 100 persons in the country. In comparison, there are approximately 250,481 firearms registered to law enforcement in the country, and around 350,636 total military firearms.